This pokies game from Playtech is based on the story of the film King Kong the tale of a gigantic ape who is taken from his native island home to become an exhibit in New York . Kong: The 8th Wonder Of The World is Playtech’s great tribute to the story and in particular the 2005 Peter Jackson film which featured a whole host of famous actors and actresses. 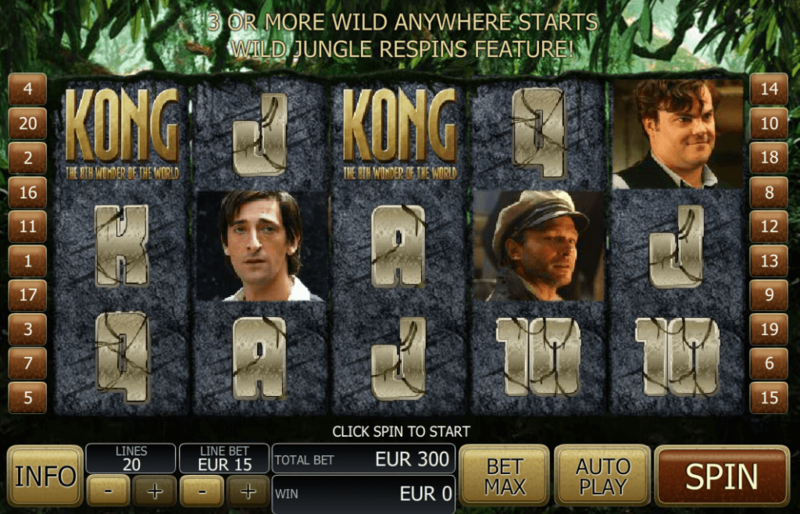 This pokies is a five reel, twenty payline machine and it’s cleverly designed to emulate the jungle atmosphere of King Kong’s island home and also 1930s New York City. The standard symbols in the game are 10, J, Q, K and A and the special symbols are the characters Carl Denham, Jack Driscoll, Ann Darrow and Captain Englehorn. The wild card is King Kong himself and the scatter symbol is the Kong logo. Kong is played in two modes – Jungle Mode and Big City Mode; the default is Jungle mode but after a scatter win it will switch to Big City Mode and vice versa. There’s a real emphasis towards bonus features here and the first one is the Wild Jungle Respins which is triggered by landing three or more wild symbols while in Jungle Mode. You will be awarded free spins and every time you land a wild it will freeze for the remainder of the round. Thee or more scatter symbols will trigger the Skull Island bonus and you will be transported to an overview of the island on which are a number of spots from which to choose. Keep picking until you match three of the same creatures for a cash prize or just one King Kong for the big payout. The background in Big City mode is 1930s New York and again, spinning three wilds or three scatters triggers the features.Three wilds will earn you the Wild Kong Respins but they’re a little different here; you get three spins and on spin one reels 1 and 5 will all be wild; on spin two reels 2 and 4 will be wild and on the final spin all symbols on reels 1, 3 and 5 are wild. Landing three scatter symbols will earn you the the City Tower Bonus and this is a fun game where King Kong is perched on the top of the Empire State Building and is faced with three planes heading towards him. Destroy each in turn to win a cash prize. The minimum bet is just $0.01 for one payline while high rollers will like the maximum possible spin stake of $300 in this interesting game that can be played for free or with real money at online casinos.